Thank you for visiting our website. Please be sure to read the Terms and Conditions contained in this document carefully since any use of this website constitutes your acceptance of the Terms and Conditions set out herein. Throughout this site, the terms we, us, our and the Center refer to The Open Mind Center and any of its affiliated companies as appropriate in this context. Any personal information or material sent to The Open Mind Center’s website are subject to The Open Mind Center policy on privacy and protection of personal data set out in the Privacy Notice located herein. Any non-personal communication or material you transmit to this website by electronic mail or otherwise, including any data, questions, comments, suggestions or the like is, and will be treated as non-confidential and non-proprietary. Anything you transmit or post becomes the property of The Open Mind Center and may be used for any purpose, including but not limited to, reproduction, disclosure, transmission, publication, broadcast and posting. Furthermore, The Open Mind Center is free to use for any purposes whatsoever (including but not limited to the developing, manufacturing, advertising and marketing of products) any ideas, artwork, inventions, developments, suggestions or concepts contained in any communication you send to this website. Any such use is without compensation to the party submitting information. By submitting information, you are also warranting that you own the material/content submitted, that it is not defamatory and The Open Mind Center’s use will not violate any third party’s rights. The Open Mind Center is under no obligation to use the information submitted. All copyright and other intellectual Property Rights in all text, images and other materials on this website are the property of The Open Mind Center or are included with the permission of the relevant owner. You are permitted to browse this website, reproduce extracts by way of printing, downloading to a hard disk or for the purposes of distribution to other individuals. This is only to be done on the provision that you keep intact all copyright and other proprietary notices and that the above trademark notice appears on such reproductions. No reproduction of any part of this website may be sold or distributed for commercial gain nor shall it be modified or incorporated in any other work, publication or website. The trademarks, logos, characters and service marks (collectively Trademarks) displayed on this website belong to The Open Mind Center. Nothing contained on this website should be construed as granting any license or right to use any Trademark displayed on this website. Your use/misuse of the Trademarks displayed on this website, or on any other content on this website, except as provided for in these Terms and Conditions, is strictly prohibited. You are also advised that The Open Mind Center will aggressively enforce its intellectual property rights to the fullest extent of the law including criminal prosecution for serious offenses. Links on The Open Mind Center websites may take you outside The Open Mind Center network and The Open Mind Center accepts no responsibility for the content, accuracy or function of these other websites. The links are provided in good faith and The Open Mind Center cannot be held responsible for any subsequent change in other websites to which we provide a link. 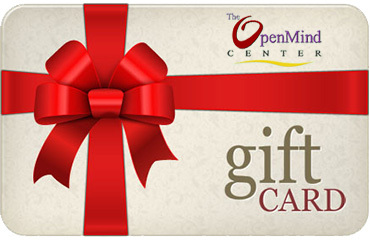 The inclusion of any link to other websites does not imply endorsement by The Open Mind Center. We highly recommend that you make yourself aware of and carefully read the legal and privacy notices of all other websites that you visit. This website is provided to you on an As Is and As Available basis and, consequently, The Open Mind Center gives no warranties of any kind, whether express, implied, statutory or otherwise (including the implied warranties of merchantability and fitness for a particular purpose) including warranties or representations that material on this website will be complete, accurate, reliable, timely, non-infringing to third parties; that access to this website will be un-interrupted or error-free; that this website will be secure; that any advice or opinion obtained from The Open Mind Center through this website is accurate or to be relied upon and any representations or warranties thereto are expressly disclaimed. The Open Mind Center nor any other party involved in the creating, producing or delivering this site on our behalf shall have no liability or any responsibility whatsoever for any direct, incidental, consequential, indirect or punitive damages, costs, losses or liabilities whatsoever arising out of your access to, use, inability to use, change in content of this website or arising from any other website you access through a link from this website or from any actions we take or fail to take as a result of any electronic mail messages you send us. The Open Mind Center nor any other party involved in the creating, producing or delivering this website shall have no responsibility to maintain the material and services made available on this website or to supply any corrections, updates, or releases in connection therewith. Any material on this website is subject to change without notice. Further, The Open Mind Center shall have no liability or any responsibility whatsoever for any loss suffered caused by viruses that may infect your computer equipment or other property by reason of your use of, access to or downloading of any material from this website. If you choose to download material from this website you do so at your own risk. (3) Uploading files that contain viruses that may cause damage to the property of The Open Mind Center or the property of other individuals. You and The Open Mind Center agree that any controversy or claim arising from or pertaining to the use of this website shall be governed by American law and be submitted to the exclusive jurisdiction of the courts of United States of America in the state of Georgia. The Open Mind Center does use tracking technology (cookies). Our web server logs collect the domain names of visitors to our web site. This information is aggregated to measure number of visits, average time spent on our web site, pages viewed, etc. We use this information to measure the use of our site and to improve the content of our site.